Under its pioneering new ‘Brexit Promise’, if a cruise is cancelled due to the UK leaving the European Union, Fred. Olsen guarantees to give guests a full refund on that sailing PLUS a free cruise. This means that, once a booking is confirmed, Fred. Olsen guarantees that no surcharges or supplements will be added to the cruise price. 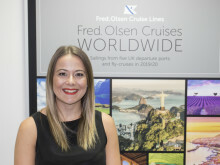 Bookings are underpinned by the security of ABTA and ATOL protection, while all cruises, shore tours and purchases made on board Fred. Olsen’s ships are priced in Pounds Sterling – so that guests can explore the world without having to worry about exchange rates. Fred. Olsen launched its industry-leading ‘Enjoyment Promise’ in 2013, from which time it has been offered as standard. Simply book more than 12 weeks ahead on cruises of five nights or more and, if guests find that the cruise is not for them within 48 hours of sailing (24 hours on Brabant river cruises), just let Guest Services know on board the ship and Fred. Olsen promises to arrange and pay for flights back to the UK from the next port and repay the cost of the holiday. Fred. 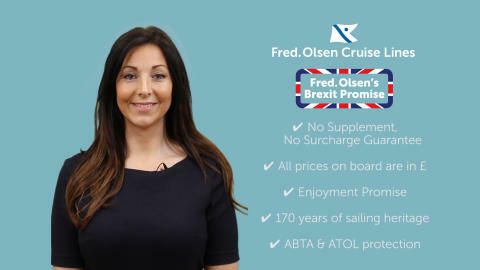 Olsen’s new ‘Brexit Promise’ forms a key part of its latest ‘Summer Sale’ campaign, which offers attractive savings on 46 Ocean and River sailings from June to September 2019, on all new bookings made from 3rd April to 3rd July 2019 inclusive. As part of the campaign, guests can save up to £400 per person on their cruise, as well as enjoying up to 200€ in cash to spend ashore on selected sailings, without the added concern of fluctuating exchange rates.